Weegee, With Bomb, 1940. © Weegee/International Center of Photography. See for yourself if much has changed in New York since the late 1930s, when Weegee worked the night beat, listening on the police-band radio for unfolding action, zeroing in on lurid murders, capturing the stares of bystanders, and doggedly getting the photo-story every night. 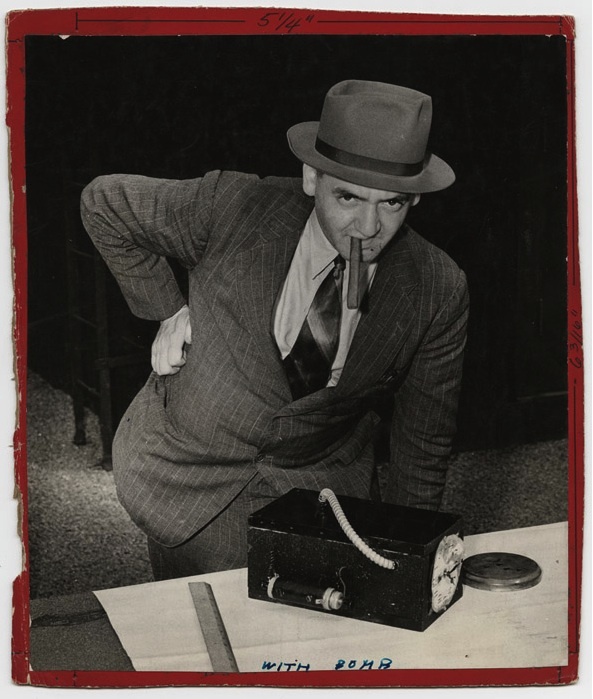 Check out the final days of the exhibition Weegee: Murder is My Business to see plenty of action. Weegee (Arthur Fellig) slept in a cold-water flat across from Police Headquarters downtown and sold his photos to one of twelve dailies published in the City in the late 1930s. He tried to “humanize” the news, so lots of the photos in the show feature reactions of bystanders to sensational crimes and scenes of mayhem. The show occupies most of the International Center of Photography’s lower level, and is filled with a recreation of Weegee’s room, his camera equipment, flash bulbs, press passes, and terrific interactive displays that bring you closer to one New York’s great documentarians of the Thirties and Forties. 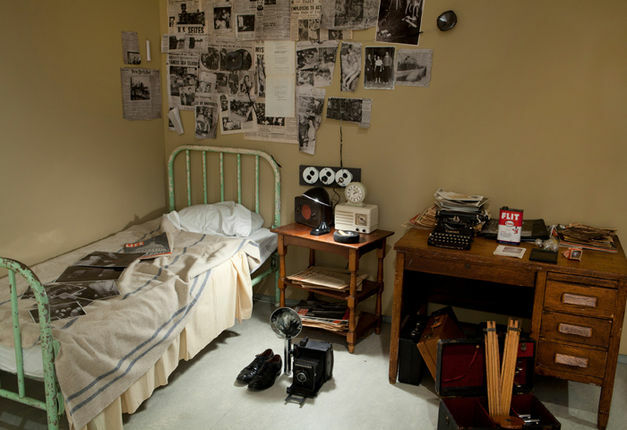 There’s even a set of photos of a gangster rub-out alongside the actual police crime ledger that documents what happened in Little Italy that night. Installation view of Weegee’s flat. © International Center of Photography, 2012. Photograph by John Berens. Maybe the curators are having fun with us, but it’s interesting that there’s a slightly out-of-the-way wall of Weegee photos of cross-dressers being arrested in 1939 alongside a gallery of 19th-century images of Jefferson Davis in a dress (President in Petticoats! ), and another gallery with Christer Strömholm’s gorgeous shots of the early Sixties “ladies” working the Place Blanche in Paris. It’s all sensational(istic) and Weegee would approve. Christer Strömholm, Belinda, 1967. © Christer Strömholm/Strömholm Estate. This entry was posted in Art, Museums and tagged art, culture, history, museums by mssusanb. Bookmark the permalink.